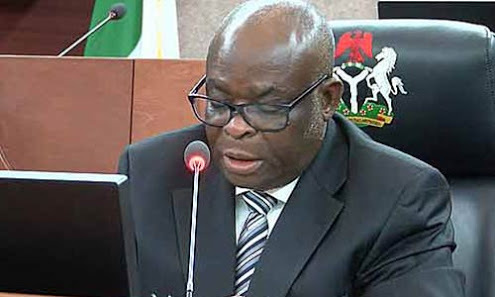 Justice Walter Onnoghen, the Chief Justice of Nigeria (CJN), scheduled for arraignment for alleged false assets declaration charges, was not anywhere around the Code of Conduct Tribunal (CCT) yesterday. His lawyers, led by Wole Olanipekun, a Senior Advocate of Nigeria (SAN), told the CCT that the CJN was not properly served the summons. He is to be personally served tomorrow. CCT Chairman Danladi Umar called Justice Onnoghen’s case at about 10:08am. But the CJN did not attend yesterday’s proceedings at the Code of Conduct Tribunal (CCT), scheduled for his arraignment on charges of non-declaration of assets. 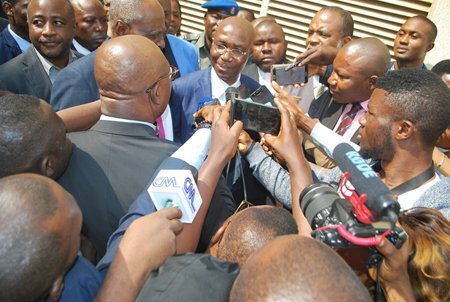 Olanipekun, SAN, led a retinue of lawyers, including 46 senior advocates, to defend the nation’s chief law officer. At the commencement of proceedings and the mention of the charge, lead prosecution lawyer Aliyu Umar (SAN) informed the tribunal that the defendant had been served with the charge and that the day’s business was for the arraignment of the defendant. Umar, however, noted that the defendant was absent and prayed the tribunal to inquire from the defendant’s lawyers why he did not attend proceedings. He argued that having been served, the defendant had no reason to refuse to attend proceedings. When Umar asked why his client was absent, Olanipekun said he (the CJN) was not properly served with the tribunal’s summons. Olanipekun also said his client had filed an application at the Federal High Court, challenging the court’s jurisdiction. He asked that the application be taken without the CJN’s presence. He cited many decisions of the Supreme Court and the Court of Appeal to support his argument that while a defendant is challenging a court’s jurisdiction or the competence of the charge against him, such a defendant need not attend court. Olanipekun also cited sections of the Administration of Criminal Justice Act (ACJA) to support his argument that his client was entitled to personal service of the court summons. He faulted the information by the tribunal’s registrar that the CJN directed his (CJN’s) Personal Assistant (PA) to accept the court summons on his behalf. Olanipekun said while the information by the court official confirmed that personal service was not effected on his client, the acceptance of the summons by an aide to the CJN did not qualify as personal service, which is required under Section 123(a) of the ACJA. He argued that under Section 124 of the ACJA, there is need for the prosecution to obtain the leave of the tribunal where it could not effect personal service on the defendant. Olanipekun said he was surprised that the prosecution was talking of arraignment when proper service had not been effected on his client and he (the defendant) is appearing in protest to challenge the tribunal’s jurisdiction. On the Chairman’s question whether or not the defendant was not aware of the pendency of the charge, Olanipekun said awareness is not the issue, but that the proper procedure provided in the law must be complied with. Responding, Umar argued that no law allows a defendant to stay at home and challenge the jurisdiction of the court. He contended that Sections 123 and 124 of the ACJA provide for personal service on the defendant. Umar added that since the defendant directed that his PA should accept the summons, it ought to be taken that he had waived personal service. He later suggested that the tribunal direct that a fresh service of the summons be effected personally on the CJN, a suggestion accepted by all. Tribunal Chairman Umar ordered a fresh service on the CJN and adjourned till January 22 for the hearing of all pending applications. The CJN was charged with six counts of false asset declaration by the Code of Conduct Bureau (CCB) on January 10. The charges followed a petition brought against him by a group, the Anti-corruption Research and Data Based Initiative, headed by Denis Aghanya. In a statement, the CCT said it received the request for the trial of Justice Onnoghen on Friday and had slated yesterday to commence with the matter. But a Federal High Court sitting in Abuja yesterday stopped the planned arraignment of the CJN before the CCT. Ruling on two ex parte applications, N.E Maha, a judge, ordered parties to maintain status quo till January 17.